Yesterday, I became the proud owner of a 4GB Echo™ Smartpen, a brilliant new piece of equipment that could offer immense benefits to researchers, journalists, or anyone else who needs to take quick, but often voluminous, notes. Upon arrival, the pen created a great deal of excitement in the office, filled with researchers constantly burdened with the exhausting task of long audio transcripts and over-filled field diaries, who were elated to see a device that would make recording as well as revisiting data substantially easier. 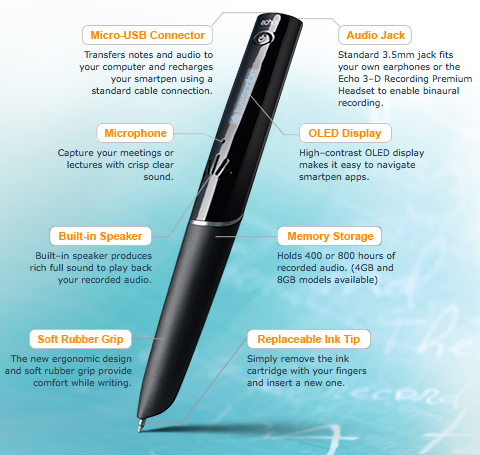 The Echo Smart pen has a number of features that make it such a boon: it has an excellent audio recorder that captures notes with perfect clarity, and features a fairly high-quality built-in speaker to play back your recorded audio in addition to the usual headphone jack. It has a built-in USB port, which makes the transfer of audio files to your computer much easier. But the seriously genius aspect to this pen is an infrared camera built into the tip of the pen, which allows you to begin, pause and end recording by tapping on an icon printed onto the pages of a special notebook provided by the manufacturer. The same camera also allows you to play back your recording from a specific point by tapping a particular point in your handwritten notes, and even to save the notes as a PDF directly onto your computer. The PDF, too, is an interactive document, allowing one to click on any point in the text to play back the associated audio recording. Usually, field researchers jot their notes in handwritten format, while the audio is captured separately. Digitizing handwritten notes, transcribing audio and then going back and forth between the two is often very time consuming. 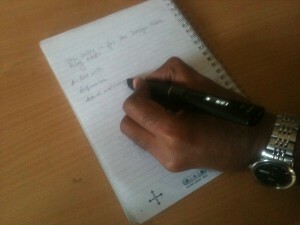 With this pen, however, one can take handwritten notes on the special notebook and the audio is captured alongside. Once the PDFs are downloaded, each page could have multiple notes and audio recordings attached, and would allow one to review and navigate through their notes with much greater ease. The EchoSmart Pen is an excellent example of the kind of innovation that could potentially transform the way we work, substantially reduce the time, energy and resources spent on recording data, and all the while make it easier for us to collect, manage, store and analyze information. It is an example of an intelligent design that could enable and speed-up future innovations and designs.